I still remember Valentine’s Day as a kid. I sat at the dining room table for what felt like HOURS addressing and signing cards for every kid in my class. In third grade, we HAD to do them all in cursive, too, which at the time was excruciating. My hand cramped, my eyes blurred, I probably cried once or twice. And it took days. I hated it. My kids have it so much better. They don’t have to address the cards individually – they only sign their names – and there are less kids in their classes as well. We often finish them in a single night. I am a big fan of NOT giving candy with their Valentine’s cards. It seems that Valentine’s Day is the new Halloween – they come home with a huge bag of candy that they will never finish and that will linger on top of the refrigerator until it “disappears” one day in April. Instead, I love giving little non-food items – and if it’s a consumable that can be used up (like bubbles or pencils), even better. Every year, we roam the Target Dollar Bins or the party aisle for party favors, or we head to the dollar store to find packs of small items for super cheap. Then I come home and design a card around the trinket. 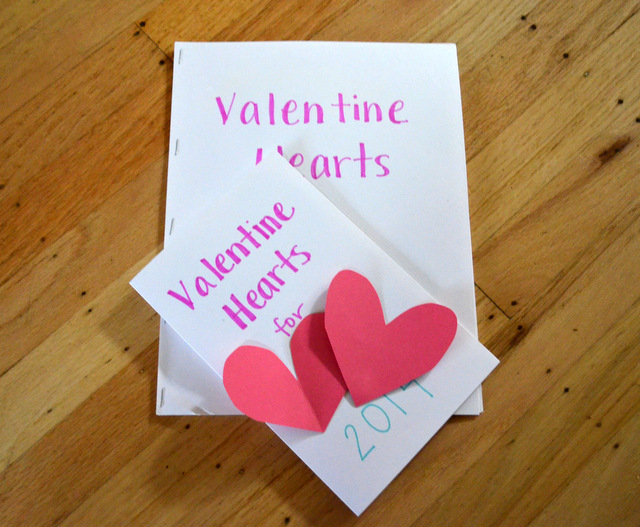 Now, I didn’t come up with this idea – there are hundreds of ideas online that you can easily download and print – just Google “printable dollar store valentines” – I got some of my ideas from there. I took them to FedEx on Saturday to print, and the woman behind counter said, “Oh no! Valentine’s Day is this week! I haven’t gotten the cards for my kids yet.” I told her she should just print mine out and use them. The amount of time I put into making sure the bouncy ball clipart bounced exactly where I want it, other people should get some use out of it, too! Have a Ball Valentine. Just add bouncy balls (we got them in the party aisle at Target – order online here). I use cheap sandwich bags to make them easier to attach to the cards – I just cut the little fold over flap free to make a basic bag – way cheaper than cellophane bags for things like this. We poked a hole in the corner and then tied the ball and bag to the card with matching yarn (orange, so obviously BB’s cards). You Make My Heart Bubble Valentine. These are BG’s cards this year. We attached bubble wands (packs of 8 from the dollar store) with washi tape . Just Write Valentine. Just add a pencil. 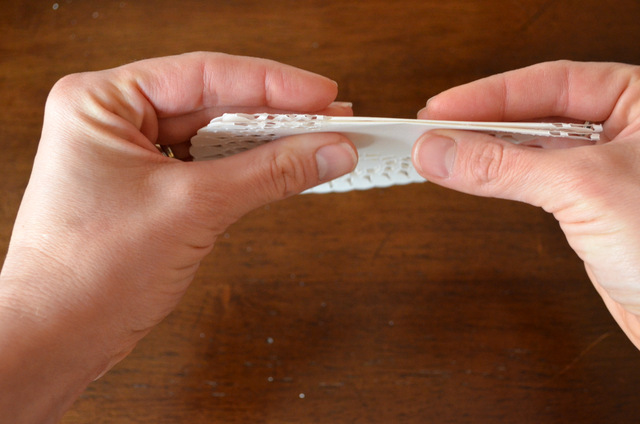 I used an Exacto knife to cut two little slits to hold it in place, but you could just attach with washi tape. A couple of weeks ago, on a rainy Monday afternoon, The Girl and The Boy and I got to work on a Valentine’s art project. I love a good craft project, but, for some reason, we don’t do this often enough. As part of my search for JOY this year, I want to create more and to spend time creating with my kids. This time, we made Valentine’s themed tea light candle holders from reused glass jars. There are no real instructions – just have fun and create whatever designs you want! It was cold and rainy, so in addition to Valentine’s hearts, we were feeling like snowflakes and swirls. 1. Snowflakes. Silver Sharpie paint marker. This was technically The Girl’s candle, although she didn’t want to do any of the actual drawing – she just wanted to direct me in my drawing. “Two lines of snowflakes with two snowflakes each. Then a heart on the bottom. Then repeat on the other sides.” Her nickname of “The Scout Master” continues – running the show, directing the troops, making things happen. 2. Hand Lettered. Black Sharpie paint marker. Simple and pretty. 3. Tissue Paper Hearts. Cut hearts out of light and dark pink tissue paper, attach to jar with Mod Podge, then cover with another coat of Mod Podge. 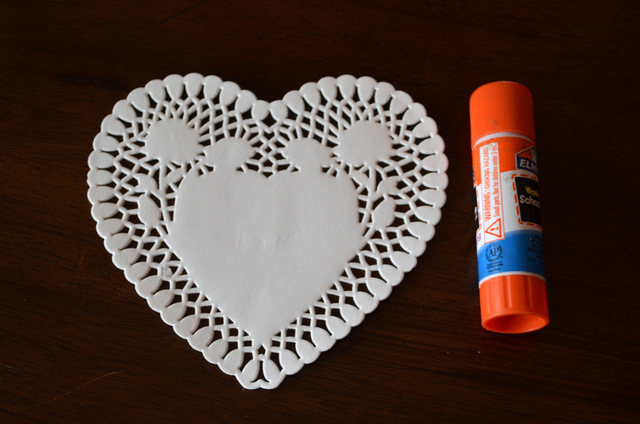 The Mod Podge gives it a cloudy finish, which looks beautiful with a glowing tea light inside. 4. Tissue Paper Cutout. 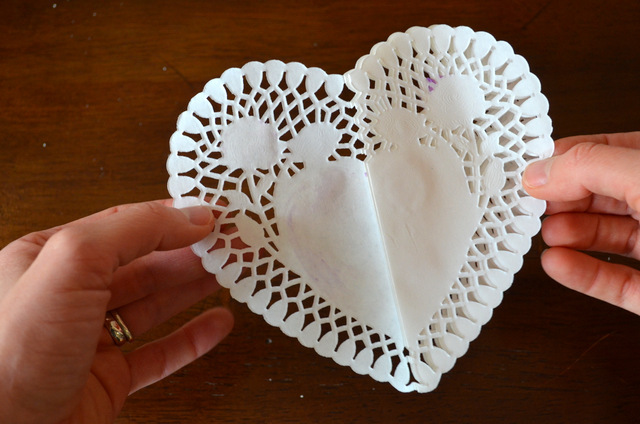 Using a strip of tissue paper smaller than the height of the jar, fold the tissue paper in half and cut out a heart shape. Spread Mod Podge on the back of the tissue paper and wrap around jar to attach. Apply a coat of Mod Podge over the top to seal. A simple, pretty project that we all enjoyed working on. Maybe we’ll make some for every holiday! Happy February! Does it feel like winter in your neck of the woods? We’ve had amazingly sunny, warm days, but there’s FINALLY some rain in the forecast. Hoping for the “atmospheric river” the meteorologists keep predicting. Even in the warm weather, I’m still pretending it’s winter, and I’ll be keeping the winter white decorations up for a little bit longer. The first day of February snuck up on me again. 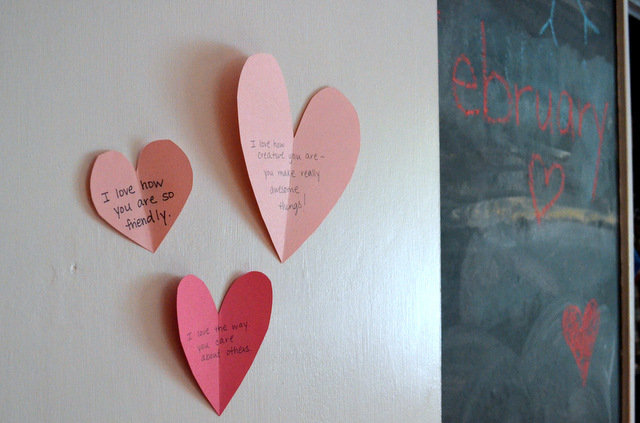 Last year, I decorated the kids’ bedroom doors with hearts for Valentine’s – a new one attached each day with a little note, telling them all the different things I love about them. It was a huge hit, so I was planning to do it again this year. And while I did win the “Happy February!” competition, I forgot about the hearts until Husband headed down the hall to get them out of bed. I ran around looking for pink paper to cut out hearts and attach them before they noticed. They seem to love it even more this year than last. Also on the first day of February, I decided do some Valentine’s projects for the house. 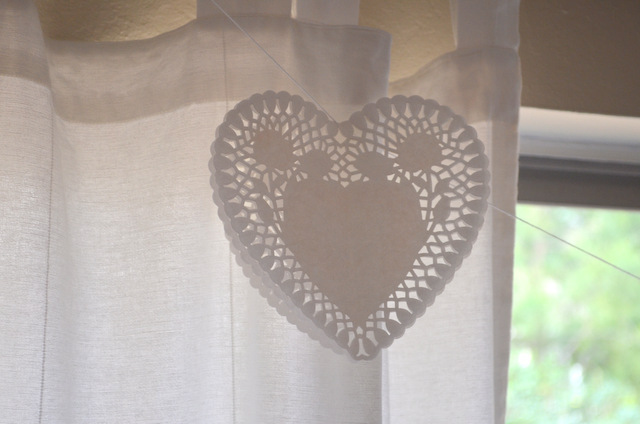 At the kids’ insistence, we added sparkly heart stickers to the tiny snow garland on the mantle and a giant heart doily to the mirror. Then I got out my latest dollar store purchase to make a garland. 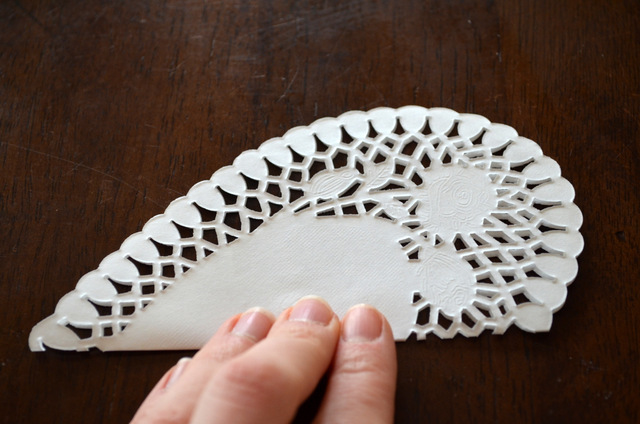 I found a pack of 30 heart shaped doilies for – you guessed it – a dollar. 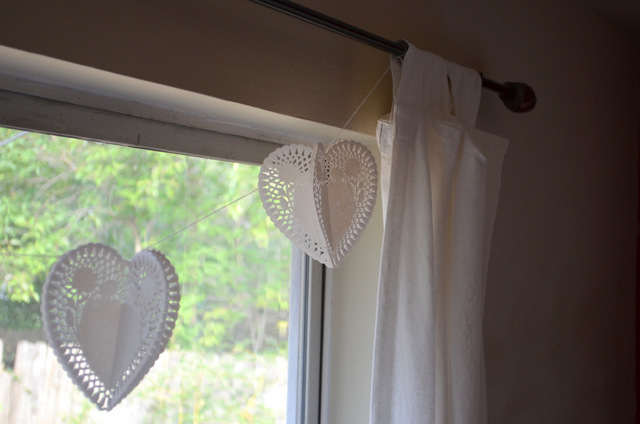 I wanted to make some 3D hearts to hang on string along the windows at the back of the house. I started by folding the hearts in half. 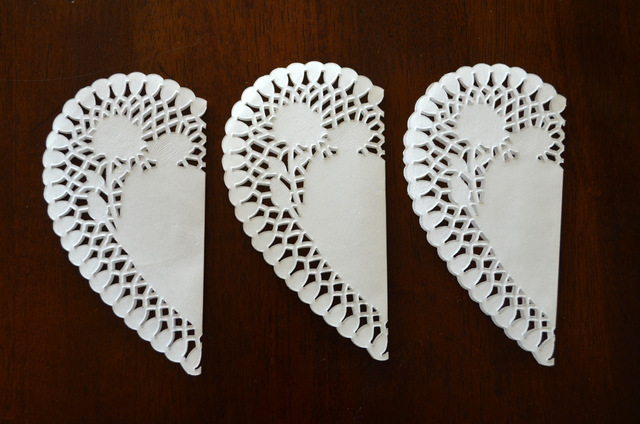 For each hanging heart, I folded three hearts. 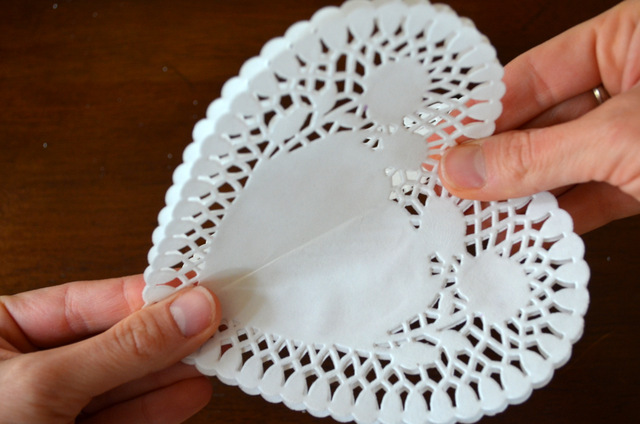 I spread glue along one outside half of the folded heart. 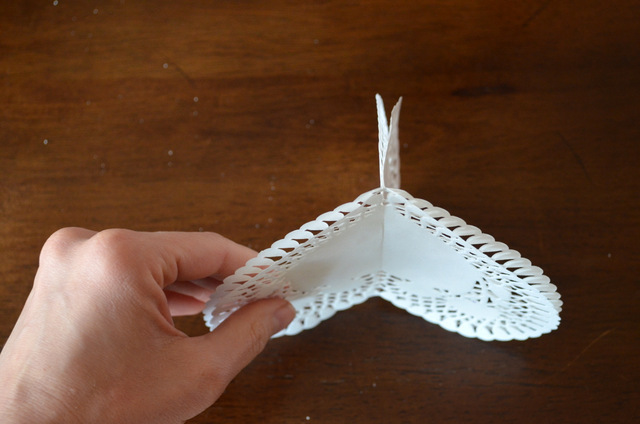 Then I placed a second heart on top of it, lining up the edges and the perforations. I repeated with the third heart, and then glued the final open half heart to the other side. This is how the heart looks from the bottom with all the sides glued. I made a bunch of these and strung them on white string. That’s it. 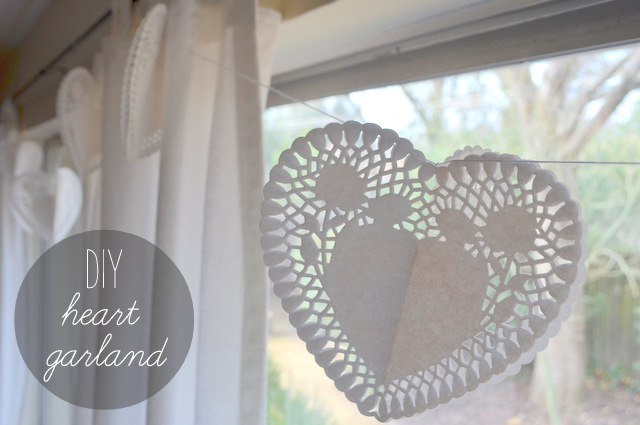 A quick, easy – and SUPER cheap – Valentine’s project. Do you have Valentine’s traditions? Husband’s birthday is Valentine’s Day, so historically, it’s usually been more of a birthday celebration. 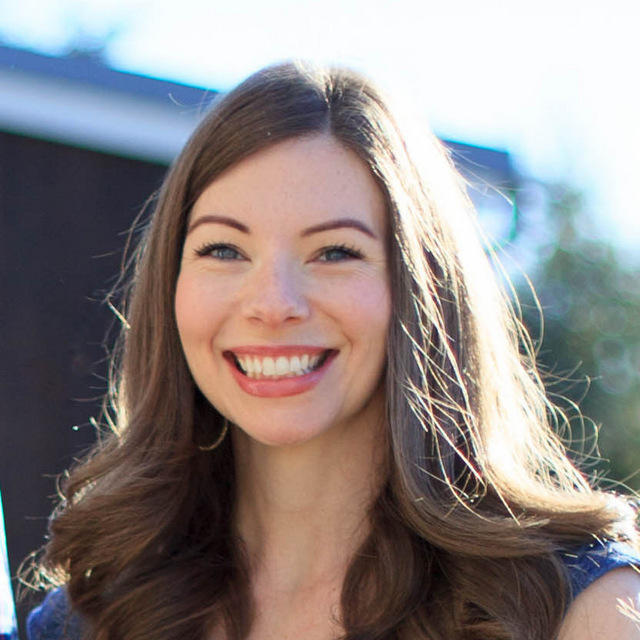 But since we’ve had kids, we’re always looking for fun traditions and little rituals to add to our family – like Valentine hearts on the bedroom doors, but also simple things like hot chocolate on Saturday mornings and Pizza Fridays. (Some that I remember from growing up were popcorn on Friday nights while watching Dallas and Falcon Crest, biscuits and gravy on Christmas morning, and, of course, Saturday morning garage sales with my Dad. And I’ve mentioned before that birthdays were HUGE in my family.) I’d love to hear what kind of traditions – big and small – you have.